Keep calm. That may be a serious challenge in the middle of a potential roof leak, but calm, focused response is what you need to get out of this crisis. Start by making a plan for your immediate response, then you can let the roof repair professionals handle the rest. Today, we’re going to walk through an emergency roof repair how to guide, then discuss your options after the situation calms down. By the end, you should have a go-to plan in case of a roof leak. Prompt action could save you from a serious headache, so let’s jump right in! First, locate the area that water is seeping through. That likely means you’ll have to get into the attic. Follow the dripping water to the point of origin. Can you see where the water is coming through? Before you do anything, take a photo of the damaged spot with your phone. It might come in handy if you plan to pay for roof repair with insurance. If you have enough daylight, take a look from the outside and see if there’s any visible signs of damage. Take pictures if possible. How Do I Temporarily Fix a Leak in My Roof? Tackling that leak quickly is essential if you want to avoid water damage, ruined insulation, and potential mold growth! Thankfully, you can perform a simple (albeit temporary) patch job on the interior side of the leak. You’ll need two large pieces of plywood, roofing tar, and a putty knife. Bring a bucket and towels too! Before you ask: no, duct tape will not fix the problem. Step #1: Start by soaking up the wet ceiling area with the towels. Step #2: Place one plywood board on top of the trussels beneath the leak. Lay the down the bucket to catch water. Step #3: Take out your roofing tar and fill the leaking hole. Step #4: Cover the filled hole with the second plywood board. Use additional tar to secure the board. Step #5: If the leak continues, you may need to cover the affected area outside with a plastic tarp. Is a Leaking Roof an Emergency? Continued leaks endanger your decking, insulation, ceiling, and wood supports. 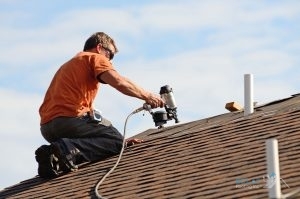 While a tiny leak can be fixed with a temporary patching, you still should schedule roof repair as soon as convenient. For extensive, spread out leaks, call your local roofer immediately for emergency services! Now you’ll need to coordinate with both your local roofing company and your insurance provider. Is a leaking roof covered by homeowners insurance? Most home policies cover damage to the roof itself (and maybe the contents below), assuming the leaks were the result of unpreventable storm trauma. Leaks caused by homeowner negligence may not be covered. You’ll need to photograph the affected areas of your roof before repairs. An official inspection and estimate from an approved roofing professional will also speed along your claim. The most experienced pros have examined countless composition shingle roofs; they know how to identify those hard to spot issues that adjusters too often miss. Want a simple guide on deciding between repair vs replacement? Damage is confined to a small section of the roof. Underlying layers show no signs of trauma or degradation. The roof is young enough to warrant repairs over replacement. The roof is in good enough condition to withstand further storms. Damage is spread out into multiple sections of the roof. Underlying layers of the roof show signs of structural degradation. The roof is nearing the end of its estimated lifetime. The entire system appears to be in poor condition. Is it Normal for a New Roof to Leak? The only acceptable reason for a new roof to leak is severe storm damage. If your brand new system has already sprung a leak in the first couple of months, you need to talk with your roofing professional about fixing the damage. You know how your Fort Worth, TX air conditioning service offers certain guarantees on its work? If your roofer is worth their salt, they should provide free or heavily discounted repairs. Looking for Professional Roof Repair? Our team at Eclat Roofing provides affordable roof repair and maintenance services throughout the DFW metroplex! If your family or business finds itself in the middle of a post-storm crisis, our seasoned professionals would love to help. They’ll talk with you about cost-effective solutions, solving the roof repair vs replacement conundrum, and building a rooftop that lasts. Ready to get started? Call 214-373-1500 (or 817-800-1881 for Fort Worth) and schedule your roof repair in Dallas, TX! 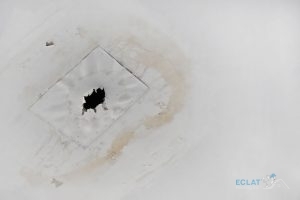 Posted in Uncategorized and tagged hail damage, leaking roof, repair or replace?, roof leak repair on March 27, 2019 at 8:04 pm by Eclat Roofing. Your home is one of the biggest financial investments that you will ever make. It is exciting to be a homeowner, but also a huge responsibility. The integrity of your home decides the home’s value and the safety it can provide for you and your family. Keeping up regular maintenance and keeping up with exterior home repairs can help ensure that you catch and fix potential problems before they cost you heavily in repairs. The exterior of your home tells a lot about its value and integrity. Keeping up with regular exterior home repairs is one of the most important aspects of protecting your home. The exterior of your house is forced to endure the worst of mother nature. In order to help you protect your greatest asset, we have compiled some ways to help you protect your home. Trim back trees, bushes, and other plant life so their branches to not reach your home. Vegetation can be a beautiful addition to any home, but they can also put it at risk if you fall behind on keeping them in line. Tree branches that reach to close to your home’s roof can cause major damages to the shingles and to the roof in general during a storm, heavy wind, or if the tree dies and becomes weakened. Roots, limbs, and vines from shrubs or other plants can wreak havoc on your home’s siding. It is important to keep them trimmed back so that there are at least two feet of space between your home and the plants. This can also aid in keeping animals that call the bushes home from moving on in with you. Keep your front and back porch, and the siding of your home, protected with a fresh coat of paint. Painting over your deck, porch, and the siding of your home will prevent them from weathering, and help maintain the integrity of your home. The paint will help seal the wood on your porch, will prevent it from splintering and harming you or your family. A fresh coat of paint can also help seal up the material of your siding and your front and back porch from moisture, which will help prevent water damage. Water damage can greatly impact the integrity of your home by weakening the materials. If this happens, the materials may need to be repaired or replaced, which can cause financial strain. Maintaining the health of your roof helps you maintain the health of your home. Perform regular maintenance and inspection of your roof. Your roof is probably the biggest financial investment in your home. It is in charge of keeping your family safe from the elements, providing insulation for your home, and helping detour water away from the interior. Your roof is vulnerable to storm, wind, and hail damage which is why it is important to do an inspection after every storm and every fall and spring. You should keep a lookout for missing or broken shingles, dark spots on the roof which can point to there being a leak, signs of mold or mildew growing on the roof, flashings being dented, and the health of the soffit and the fascia. If you notice a problem with your roof, it is advised that you seek help from a professional roofer to help repair damages, and maintain the health of your roof. This will prevent an early roof replacement. Also, a professional roofing company will be able to help you with the inspection as well. (Wondering who you can turn to when it comes to your roofing needs? Call Eclat Roofing at (214) 373-1500 to speak with one of our expert roofers today! Keep your doors clean. You can accomplish this by making sure to wash them regularly. Don’t use chemicals that are too abrasive. Your shampoo is a great (and admittedly odd) resource to use to clean your door. This will help you notice if there are any small holes or cracks on your door and avoid from warping the material. If you ever notice pooling water near or around your door, this is a sign of a leak and you should call a roofing contractor to check the status of your soffit and fascia. Perform regular maintenance on gutters, paying special attention to removing any debris that may be clogging up the pipes. Clogged pipes and gutter lines can cause water to pool up and leak onto your roof or porch. It can also cause sagging of the gutters, which can warp the metal. It is important to regularly clean your gutters, especially during the fall or after a storm to ensure that you will not have to do a gutter replacement, which can be costly. Don’t allow cracks in the concrete or driveway of your home to linger for too long. The changing of seasons can cause problems for your driveway and concrete walkways. When water gets trapped into absorbed into the concrete and then freezes, it causes cracks to form in the concrete. This can then be a breeding ground for bugs or even an unintended invitation for weeds to make their home in the cracks. When this happens, the cracks grow larger as the plant’s roots pick apart the concrete as the plant grows. Cracks can also create a hazardous environment for you, your family, or guests who can easily trip over larger cracks. It is important to get the smaller cracks as soon as you notice them to avoid more costly fixes as the cracks continue to grow bigger. Inspecting the integrity of your fence. Your fence not only provides protection and privacy for your back yard but also makes it harder for burglars or animals from breaking into your backyard or home. Make sure you replace broken or split boards, to help maintain the strength of your fence. Also, painting it regularly will help avoid cracks and seal the material up from moisture, protecting it from water damage. If you have an electric fence or gate, it is advised you seek out professional help when trying to replace broken parts, so you can avoid electrocution. Don’t forget to do your exterior home repairs to keep your home healthy. At Eclat Roofing, we are dedicated to helping protect your home with our variety of roofing services. If you feel that the exterior of your home may be in jeopardy because of a faulty, leaky, or old roof, call us today at (214) 373-1500 to speak with a representative. 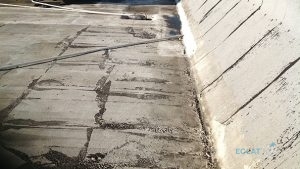 Can I hire someone to perform a deck repair for me, or do I have to do it on my own? You can hire a Home Improvement Contractor or Specialist to help you repair any broken boards or even repaint your deck. You never have to do anything alone. How can I keep my mobile home safe from damages? A mobile home is pretty much the same as a regular home in terms of upkeep. Make sure that there is no denting in the materials used on the siding, as well as ensure any deck that you may have is well maintained and shows no signs of wear. Keeping plants at least two feet away from your living space will help cut down on damages caused by storms and ensure that pests don’t invade your home. What are some other things I should consider when thinking about home repairs? Make sure that the stucco, the fine plaster used for molding in architecture, is free of cracks and or large blisters. Keep your windows clean and use that time to inspect frames and sashings of damage. Posted in Uncategorized on January 24, 2019 at 2:53 pm by Eclat Roofing. What Do You Do When Your Roof is Leaking? Timely Roof Repair Can Protect You From Thousands of Dollars in Restoration Costs. Many homeowners have experienced it. Having a roof leak can create a serious headache for you and your family, but the problem only gets worse if left alone. It doesn’t matter if your have a composition shingle installation or a tile rooftop. 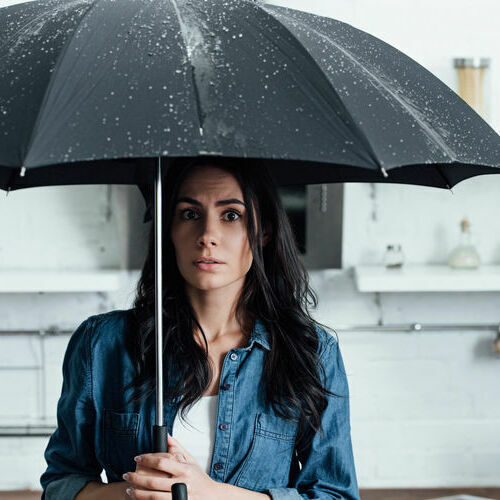 Understanding what to do to protect your home from further damage could be the difference between a minor inconvenience and thousands of dollars in roof repair costs. Is a Roof Leak an Emergency? In most circumstances, a basic roof leak would not be considered an emergency. That doesn’t mean that you should ignore the problem. Quite the opposite. You should attempt to find the leak as quickly as possible, even if it means you have to crawl up into the attic during the next rain. There are some situations that obviously call for your local Dallas, TX leak detection & repair company. Extensive water leaks and stains should have you picking up the phone right away. At the very least, your local roofer can install a protective tarp over your roof to prevent immediate damage. How Do You Repair a Roof? The first part of any repair is a thorough inspection. While examining your roof, you (or your trusted professional) can start by looking for any obvious signs of damage. Missing shingles (tile, etc.) for instance, should be replaced as quickly as possible. You’ll also want to be on the lookout for cracked shingles, which are particularly common after a nasty hail storm. 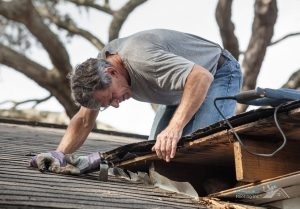 Next, you’ll want to look for minor damages that can be fixed with small roof repair. Curled shingles are an easy fix. How do you fix curled shingles? Start by cleaning away any dirt or debris beneath the uplifted shingle, then apply a bit of roofing cement along the uplifted edge of the shingle. The full service roof repair service will carefully examine your roof for signs of potential leaks. The usual suspects are busted shingles, degraded flashing, and clogged gutters. One quick tip: damaged flashing will actually funnel water into your house, so have it repaired ASAP! Once all signs of trauma have been identified, your roofing professional can outline your best path to repair or replace your roofing. Roof Leaks Can Lead to Serious Ceiling Damage and Wood Rot, if Left Alone. That is a crucial question that you, your roofing company, and your insurance agent will need to work together to answer. It’s crucial that you get a roof inspection as quickly as possible, so that you can learn what action you need to take next. Extensive damage across multiple sections of your roof will likely necessitate complete roof replacement. If it’s only a few shingles missing, simple repairs are usually your most cost-effective option. That being said, there have been countless situations that straddled the line between repairs and replacement. For instance, a roof with five or more years left on its expected lifetime might be worth holding onto, unless your insurance is willing to cover the cost of an early replacement. No matter what decision you make, you’ll want to make it soon to avoid secondary water damage to your home. Will Insurance Fix a Leaking Roof? In the majority of homeowner policies, your insurance will likely cover the cost of fixing the roof leak. They may even have a designated company to come and perform the repairs, but you should have some leeway over who you trust to do the job. However, your policy is far less likely to cover the cost if the damage was the result of negligence on your part. Let’s say an oak tree next to your house dies and gradually starts to droop over your roof. A mighty wind storm blows through the community and knocks that tree on your house. Your insurance may claim that you knew the risk of leaving the dead tree next to the property, and therefore deny your claim. But, if the tree was healthy and the damage unforeseeable, your company will likely honor the policy. What Type of Water Damage is Covered by Homeowners Insurance? Traveling Water From Roof Leaks Can Lead to Expensive Mold Damage. When it comes to water damage caused by a roof leak, coverage generally depends on the surrounding circumstances. Was the damage the result of a sudden, unexpected hail storm? Or was it the predictable result of a history of poor maintenance? Again, if your insurance company determines that the trauma could have been avoided by basic repairs, you’ll probably have to foot the bill for fixing the roof and restoring your home. If you’ve been faithful with repairs and the damage is the result of catastrophic storm trauma, your policy should cover internal damages as well. It’s dangerous to make blanket statements about policy coverage. So make sure you examine your homeowner’s policy carefully. Schedule Your Roof Repair Today! You don’t have to play the roof repair vs replace guessing game! If you’d like to schedule a professional inspection for your home, talk to one of our pros today at Eclat Roofing! You can schedule a repair appointment by calling us at (214) 373-1500. For assistance in Fort Worth, contact our office at (817) 800-1881! Posted in Uncategorized on November 21, 2018 at 9:51 pm by Eclat Roofing. 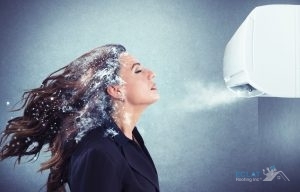 You May Like a Cold Home, But Do You Really Need the AC Running While You’re Gone? Consider all the essential appliances you depend on each and every day. Your water heater, your air conditioner, and your plumbing all provide the modern comforts we take for granted. To aid you as you maintain these home appliances and to extend the life of your personal investment, here is a brief homeowner’s guide! When it comes to maintaining your home appliances, efficiency is key. Limiting waste and shortening run times will not only save you money on your monthly bill, but it will also extend the life of your invaluable appliances. Try charting your daily usage of water, electricity, and gas. Take careful note of peaks and lull times, plus the hours that no one is in the house. You can utilize intelligent learning equipment (such as the Nest Thermostat) to help you limit appliances usage while you’re out of the house. Otherwise, try limiting waste related to usage habits. For your plumbing system, consider your water quality. Do you have problems with heavy water loaded with nasty mineral deposits or dirt? These impurities gradually, but steadily afflict your entire plumbing system, corroding metal and causing unpleasant clogs. There are plenty of water quality solutions to protect your supply from mineral deposits, such as the Rhino water filtration systems. Which Household Appliance Uses the Most Electricity? One of your most expensive home appliances is your heating and cooling system. Your HVAC system accounts for almost half of your home’s daily energy consumption. Any improvements for your HVAC system can both extend the life of your system and lower energy costs. Your home’s roof and attic both play a huge role in protecting your HVAC system, so that’s where our tips apply. First, consider adding additional insulation to your attic. You’ll want to select a product with a high R-factor and good coverage. The more outside air and heat that comes through your attic, the more energy your HVAC system will use to compensate. The average return on investment for additional insulation is beyond 100%, meaning you will gain money over your investment costs. Another project you can consider is a cool roof replacement. Cool roofing provides an added barrier between your home and direct sunlight. The more light and heat your roof reflects, the better your home energy efficiency will be. Metal is general the preferred material for homeowners, but there are a few other options you can find on the market. Ask About Our Metal Roof Installation Services! If you’d like to learn more about how a Dallas, TX metal roof installation can save you money, give our team in Dallas a call today at (214) 373-1500! You can also reach our Fort Worth professionals at (817) 800-1881. Posted in Uncategorized on October 4, 2018 at 7:29 pm by Eclat Roofing. There’s no denying that wood shake shingles are absolutely gorgeous. They upgrade a typical shingle roof into something beautiful and long lasting. While wood shake roofs are premium roofing systems that last for decades and withstand severe weather, they do have some downsides that are important to note. Homeowners need to be aware that wood shake roofs are the most high maintenance roof available, and that is time and effort, along with money that they must be willing to sacrifice for aesthetics. If you are needing wood roof installation or repair in DallasDallas, TX, call Eclat Roofing at (214) 373-1500 today. Since these shingles are made of real wood, they are extremely flammable. Many insurance companies won’t accept real wood shake roofs anymore. Nowadays, a lot of wood roof shingles are sprayed with fire-retardant coatings to eliminate chances of catching fire. You can also get your wood shingles stained with products like Sikkens Deck and Trim Stain to make their natural finish stay vibrant for years. Wood expands when wet, so hiring a certified and legit roofer to properly install the shingles with enough space apart to give them room to expand is critical. Moss and algae easily grow on wood roofs due to water being able to get trapped under and inside the wood shingles. Roof cleaning using pressurized water can clear the growth. Since these roofs are made from real wood, insects infestations are possible. You can get your roof chemically sprayed to prevent termites from destroying it. Posted in Uncategorized on August 31, 2018 at 8:45 pm by Eclat Roofing. A Leaking Roof Indicates Present Damage On Your Roof. When a storm rolls into the area, you anticipate that your home will be protected and safeguarded against potential damage and water by your roof. Your roof acts as the first line of defense for anything that can be thrown your way, including hail, high winds, debris, and more. To ensure your roof is ready for anything, it is important to have it regularly inspected and repaired. However, even with these services, as a homeowner, you may one day face a leak. Leaks can be formed by a high and sudden impact on your roofing system, creating a dent or puncture that allows water into your home. If this happens to you, do not panic. A qualified roofer can repair your leaking roof and get it back to its best. It is important when you first notice water entering your home to schedule a roof repair to minimize any possible issues that water can cause to your home’s structure. Can Roof Leak Cause Mold? The sad truth is that by the time many homeowners notice a leaking roof, water may have been present and seeping into the home for quite some time. You may wonder how much damage water can really cause to your home. The answer is that it can be devastating if left unchecked. Water is invasive, getting in all parts of your home’s structure and on your belongings. Once it travels through your roof leak, it can moisten your insulation, warp your boards, stain your furniture, and even structurally damage your drywall. 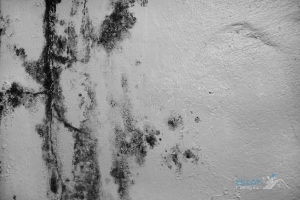 Even if it just creates a little moisture, water can create a happy environment for mold in all of these areas, creating the need for replacement in your home. Mold spores are always present, but they require moisture in order to grow. A leaking roof can create the proper environment for this hazard to grow in your home. If there is mold in your home, you may experience irritation of the eyes, nose, lungs, and skin, along with health concerns. This is why it is so crucial to act when you notice that there is a leak, to prevent excess damage and even reverse the current damage. As stated previously, if you notice a leaking roof on your home, you should contact a roofer immediately for service. If you are feeling proactive, you can even get a temporary patch kit from your local home improvement shop in order to stabilize your roof and prevent any more water from getting in. However, it is important to remember that roof patches as temporary. These will eventually fail and allow water to seep back in, or even allow your roof to grow worse. If you have a leaking roof and need service today, Eclat Roofing is always available to assist you. Our roofing contractors are your local experts providing you with high-quality roofing and great customer service. give us a call today at (214) 373-1500 for your roofing needs in Dallas, TX. Posted in Uncategorized on July 30, 2018 at 9:48 pm by Eclat Roofing. 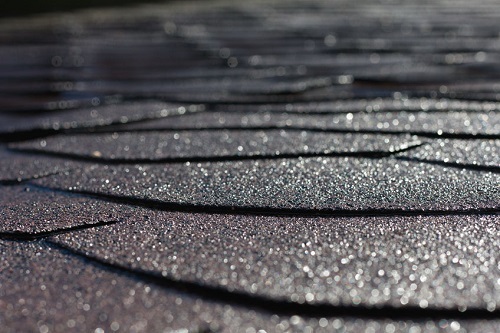 If Your Roof is Still Structurally Sound, a Restorative Coating Could Save You Money. When your commercial roof starts nearing the end of its expected lifespan, it starts to walk the fine line between asset and liability. 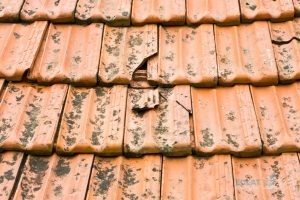 What’s the next right step to take when your roof starts to act its age? A wrong action could lead to unnecessary expenses, while inaction almost certainly have dangerous consequences. If you’re not sure which way to go with your commercial roof, use this helpful guide to get you started. Keep in mind, these solutions will specifically apply to traditional flat systems. You may have started to notice cracking and minor holes in the surface of your roof. Your system still has a few good years left in it. You normally don’t experience any problems with your roofing system. In this scenario, premature replacement would be wasting an unexpired company asset. Instead, you’ll want to consider roof restoration with a special coating. This will both repair the minor scarring and abrasions to your existing system and add up to additional years to its expected lifetime. If you’re roof has experienced significant trauma (maybe from a storm or falling debris), you’ll want to determine how much value is still left in your roof. If you still have several years left in its expected lifespan, repairs will probably be the most cost-effective alternative. Afterwards, you might also consider a roof coating. Over time, your roof has experienced significant degradation to its structural integrity and protective capability. You find yourself calling your local roofer on a regular basis for general repairs or leak patching. In this case, you’ll need to ask yourself a tough question: “Does the rising expense of maintaining my building’s roof outweigh the investment cost of a new system?” You’ll want to factor in enhanced functionality (and potential energy savings) into your calculations. Odds are, you’re going to find replacement to be cheaper in the long run. For more information on caring for your commercial roof, feel free to talk with one of our specialists from Eclat Roofing. All you have to do is call __PHONE__. Posted in Uncategorized on June 22, 2018 at 4:28 pm by Eclat Roofing. You make sure to always take care of your home; you vacuum, mow the lawn, and make sure the house stays at a good temperature, but do you ever stop and think about your roof? Your roof is an important part of your home that you should be paying attention to. There are many ways to be able to do this, but one large way is to make sure that you having your roof inspected once every year. This entails that a roofing contractor comes out to your home and does a full inspection to make sure that it isn’t up to par. This will keep it looking great and keep from things like falling or loose shingles, roof restorations, and even roof replacements down the road. When you need a roof inspection, it is important that you choose a reputable company that you can depend on and that will be there for you throughout the entire process. because if you do have a warranty, by you getting your roof inspected, you can find anything that is wrong and have it fixed right away. Call Eclat Roofing at (214) 373-1500 when you need to find the best roofing contractor around. Posted in Uncategorized on May 21, 2018 at 8:40 pm by Eclat Roofing. Have a Critter in Your Roof? With the approach of Spring, comes new life around your neighborhood. Squirrels, possums, and raccoons are just a few neighborhood animals that are greeting new faces to their family. Insects are hatching, bees are buzzing, and birds are hearing new chirps in their nest. It’s great, right? Not for roofing. The fact is, animals who are looking for a quiet, warm place for their young may be eying your roofing system or attic. Animal roof damage can be costly and time-consuming, but these signs can help you catch the problem early. 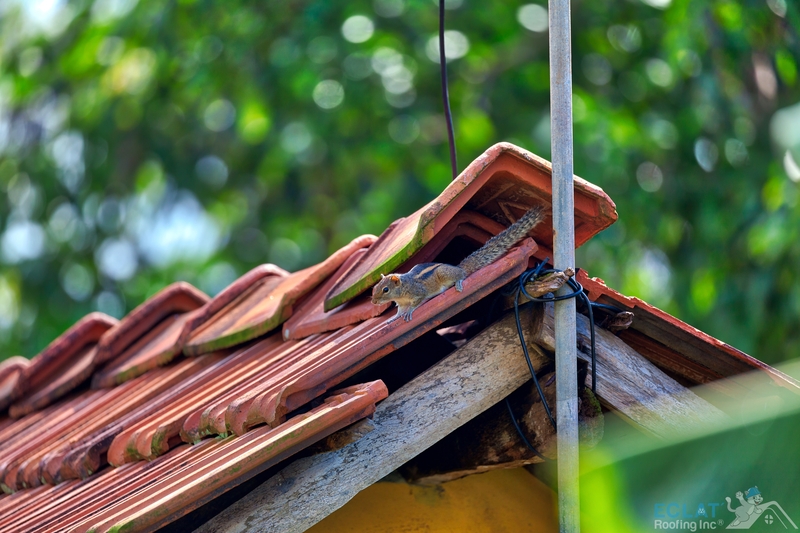 Animals Can Quickly Damage Your Roof. If You Have One in Your Roof, Call us Today. Animals must have an entry point to get inside your home, and if they cannot find one, they may create one. These can be visible just under your roof’s edge or near places like chimneys and vents. Animals can easily break shingles to gain entrance to your warm attic space. They can also burrow underneath tile or metal to tear a hole into the underlayment for entry. These occurrences are both prime signs of a four-legged visitor. Once an animal has created a hole in your roof, you will experience leaks when it rains. This will be evident by water stains on your walls or ceiling and moisture in your attic. Typically, when your home is quiet, you will be able to hear your furry friend inside your attic. You may also have an animal odor in your attic or even coming through your vents. One telltale but largely unnoticed indicator of a friend in your attic is the increase of droppings on your roof or in your gutters. Animal roof damage can be quite costly if not detected in time. However, staying alert for the signs of a furry creature in your roof system can prevent expensive damage and keep your roof intact. If you think you may have an animal problem and need roof care, call the Eclat Roofing experts at __PHONE__ for help. Posted in Uncategorized on April 17, 2018 at 4:20 pm by Eclat Roofing. 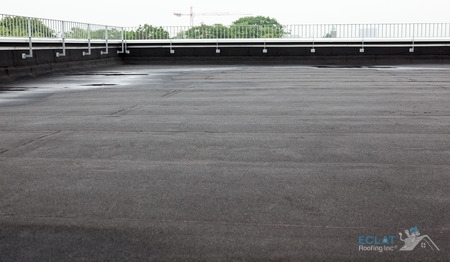 EPDM Is a Popular Selection Among Single Ply Membranes. Single ply membranes have become a popular solution for commercial roofing, and with good reason. Easy to apply and maintain, a single membrane ensures that your roof has adequate protection against water and other elemental threats. If you remain on the fence about single ply roofing, consider the following benefits. Lightweight roofing solutions provide a couple of advantages. First of all, they are easy to apply. This will save you money on installation and labor costs. Secondly, they put little stress on your building’s structural elements. This means that you can save money on construction, as you will need less reinforcement for your roof. Single ply roofing comes in an immense array of styles and colors. If you want to customize your structure, or emphasize visual elements of your company, single ply membranes provide an ideal solution. Industrial and commercial roofs tend to have many protrusions. The presence of vents, chimneys, and HVAC components can place unique demands on a roofing material. In order to provide adequate coverage of the gaps and seams around these elements, you need a material with premier malleability. A single ply membrane has this feature, which also allows for more freedom in the design of your roof. For an affordable and highly beneficial roofing solution, it’s hard to top single ply membranes. At Eclat Roofing, we are the local solution for single ply roofing in Dallas, TX. The next time you need a new roof or roofing replacement, call our team at __PHONE__. We can promise fast, friendly service to provide you with a new roof. Posted in Uncategorized on March 14, 2018 at 4:13 pm by Eclat Roofing.